One of the best parts of my job is to promote our best and brightest firefighters and emergency medical personnel. This year I had the honor of promoting the very first woman to the rank of Assistant Chief, the second highest position in the department. Jennifer Aubert-Utz is now the highest ranking woman in the history of the Department, as one of three Assistant Chiefs. I can remember when I first started in the department in February 1977. That year, the U.S. returned the Panama Canal to Panama, the first Apple II computers went on the market and the winter was so cold that the Chesapeake Bay froze over and they had to bring in ice-breakers. Also, it’s hard to believe, but at the time there was not a single female firefighter or paramedic in the Baltimore County Fire Department. I’m proud to say that we are now one of the top departments in the country in hiring females. The department has approximately 1,000 sworn members; 20 percent are women, while the national average for women in fire departments is 3 percent. Jennifer Aubert-Utz has spent nearly 17 years in the department. She has steadily moved up the ranks, starting as a Firefighter/EMT. Recently she served as commander of the Fire-Rescue Academy. 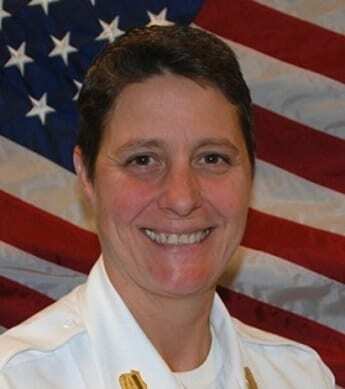 She earned a Master’s degree in Management at Johns Hopkins University, and completed the National Fire Academy’s challenging four-year applied research program to attain the Executive Fire Officer designation. She has devoted time to Mothers Against Drunk Driving and has taken a particular interest in pedestrian safety concerns, serving on pedestrian safety committees for the County and the Baltimore Metropolitan Council. “I feel honored to be chosen as the first woman to attain the rank of Assistant Chief. I hope I can inspire other young women to pursue careers in community service,” Aubert-Utz said. She has earned the respect of our personnel with her vision and skills, and it is not so remarkable that she is a woman, but that she is so talented. She is recognized across the country for her leadership. She is a role model and leader for both men and women in the fire service. Paul Lurz joined the department in 1990 and spent six years as a member of the department’s Hazardous Materials Response Team. He has worked in all three geographic divisions of the county, with his most recent assignment as the Division Chief for all of D Shift. In addition to his new role as Assistant Chief, he is also the Deputy Director of Emergency Management for Baltimore County, focusing on citizen preparedness, grants management, and planning. One area of interest is in ensuring that our vulnerable populations are properly served. Lurz earned a Master’s Degree in Management from Johns Hopkins University. Division Chief Wayne L. Tome Sr.
Wayne Tome joined the Baltimore County Fire Department in 1983. He served as a paramedic until his 1986 promotion to EMS District Officer (Field Supervisor/ Lieutenant). He was subsequently named EMS Shift Commander (Captain), Fire Director for Emergency Medical Services, and has served as a Battalion Chief since 2012. He is also the mayor of Port Deposit, Maryland. Lonnie Ledford joined BCoFD in 2000 as a member of the 81st Recruit class. He has spent much of his career serving communities on the east side of the county, serving as a Fire Specialist, EMS Lieutenant and Fire Captain in Dundalk, Fullerton, and Towson. In 2015, Ledford worked as the Operations Captain of the Fire-Rescue Academy and as a Public Information Officer. He completed a Master’s degree in Management at Johns Hopkins University. Tom Ramey joined the BCoFD in 1999 as a member of the 78th Recruit Class. He has held multiple positions including Firefighter/EMT, Paramedic/Firefighter, and EMS Lieutenant. He most recently was a Fire Captain at the Fullerton Fire Station, also serving as a Peer Fitness Trainer. He has been active with the Professional Firefighters of Maryland and earlier this year completed a Master’s degree in Public Administration from the University of Baltimore. Baltimore County Fire DepartmentChesapeake BayJohn HohmanLonnie LedfordPaul LurzThomas RameyWayne Tome Sr.